Margaret and Taylor are sister and brother, and this book relates the events that happen to them surrounding their grandfather’s birthday party. From finding a gift for Grandpa, to losing a party balloon, to fighting over a piece of leftover cake, this book captures all the daily joys and trials of having a sibling. The most remarkable thing about this book is the dialogue. Margaret’s voice is that of the typically bossy and conniving big sister, but Taylor’s voice comes through time and again as that of the little brother who will not let his sister win. The back and forth between these two characters sounds real, and brings to life a relationship that most kids with siblings will find very familiar. Little brothers will rejoice when Taylor occasionally gets the best of his sister, as he does when she forgets about her cake, and he eats it. Big sisters will be secretly tickled when Margaret is able to convince her brother to do something wrong, like open the mail, or when she invents an imaginary friend and makes Taylor feel bad for not being able to see her. Another really interesting feature of this book is its one nearly-wordless chapter. The entirety of Grandpa’s birthday is told in pictures, with the exception of one page where the word “Surprise!” is written many times over, expressing how the guests greeted Grandpa. The illustrations include details such as the hats, cake, and balloons that figure into later interactions between the two kids as well. 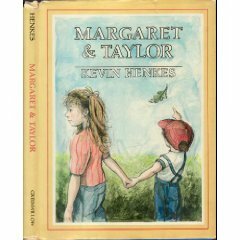 Margaret and Taylor was published in 1983, and it was only Henkes’s third book. Though his work has evolved over the past 30 years, it is interesting to look back on this early title to see how it relates to his more recent books. The “surprise” page reminds me of a similar moment in his picture book, Shhh, from 1989, where a young girl creeps into her parents’ bedroom and wakes them up with a loud chorus of good mornings. The tension between the two siblings makes me think of Lilly’s anger toward her new brother, Julius, in Julius, Baby of the World from 1989. Most of all, his serious, introspective, and thoughtful writing style is present in each of his longer works from 2003’s Olive’s Ocean to this year’s The Year of Billy Miller. Margaret and Taylor is out of print, but despite its age, it still feels very timeless, like most Henkes books. If you can find a copy in a library, it’s absolutely worth checking it out and sharing it with the Henkes fans in your life. Kids who enjoy this retro title might also be interested in reading Johanna Hurwitz’s series about the Riverside Kids.